Addison will be the “fancy girl” in her batik and floral bibs this Autumn. I decided to alter the construction slightly. I went to my Resource Center, and retrieved some warm & natural cotton batting; and to container of stabilizers and got out a strip of “tear away”. I layered the fabric, the batting, and the stabilizer, and did some straightline quilting of the bibs with the stabilizer on the back. Once the quilting was finished, I removed the “tear away” stabilizer. I was happier doing that than digging out all the fuzz on my feed dogs that the batting would have left behind. Once it was all removed, I assembled with the PUL in the middle, and flannel on the back. I “mastered” the snap tool and now these 3 are ready for Addison to try on. 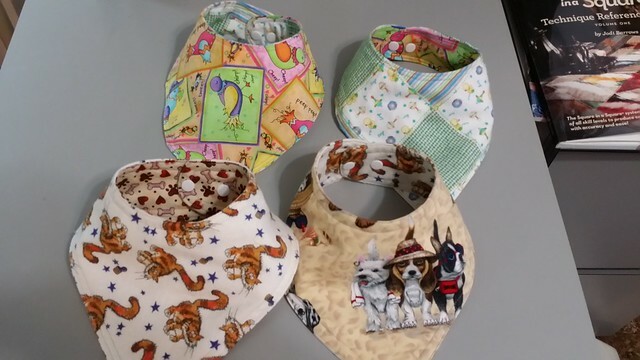 I am going to be able to get another bib out of each of these fat quarters, so will do some in the “bandana” shape next. I also have been working on tote bags for my other Guild. Helping Hands Quilt Guild, in Dover Delaware is supporting the local food bank project at the church where the meetings are held. The food bank is in need of durable bags for holiday distribution of food. They need to be strong enough to hold a turkey. One of the members prepared take & make kits. I took one kit, and 3 extra labels. I have lots of upholsetery fabric, so I figured I could do a few more. I have 3 finished, and will do one more this week to put that last label to work. Carole at From My Carolina Home is having an Autumn Jubilee on her blog. She is sharing photos, and asking for people to share their Autumn projects on a FLICKR page. Take a peak at what has been done so far – Flickr Autumn Jubilee photos . I decided that I would share these photo’s with you all here too! I know these don’t look much like Autumn, but it is the best I have today ! Do take time to check out Carole’s blog post. She is starting a quilt along on Friday! I finally had a chance to sit down and get back to work on my “MITTENS” project, and am currently “webbing” another batch of 81 blocks. I haven’t been able to work on this for 3 weeks, and I would really like to get “some assembly” done! I love the process of webbing to keep all the parts in the proper order! Bonnie Hunter talks about that method sometimes on her blog. If you recall, there was a section of “nose” that I needed to fix, but I haven’t gotten there yet. I will once I get the next row in this batch of blocks! 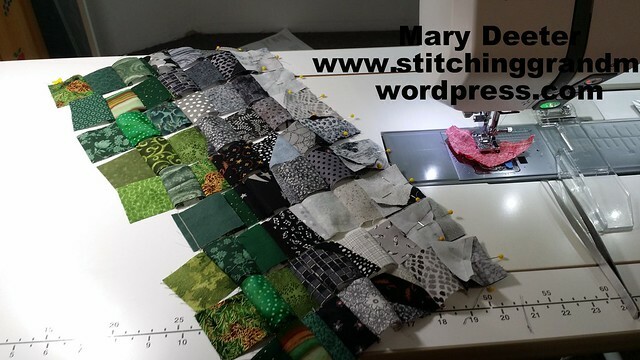 The projects are stacking up around my design wall, (3 bins for my Bonnie Hunter class), and on my cutting table are more fabrics for baby bibs, and I have a trip in less than 2 weeks; and I want to do Carole’s quilt along! So I must say goodbye for now, turn off the computer and get back to stitching! NOTE: REVISED POST – Sometimes my links I enter “disappear” between the time I add them, and the time I finish. In this post the link to Bonnie’s Show & Share dropped off. It is now reposted! Bonnie Hunter’s blog address is http://www.quiltville.blogspot.com . Now, back to my post………….. So, as you may have read – a few days with Bonnie Hunter – at a class; a lecture or a retreat can be a lot of fun! My friend Judy commented that “You have more fun than the rest of us put together”. Well, I do try! At this point in life, if it is not fun , then I am not doing it! PERIOD. There are a lot of “levels” of what I would call fun. From the blissful joy of holding a new grandchild for the first time, to the wonderful feeling you get when you serve meals at church, to the companionship and friendship, conversations and coffee while you sort and fold donated fabric, to the gathering of friends to sew together, or the peaceful quiet of the morning with your first cup of coffee. Maybe fun is the wrong word….perhaps joy is a better choice. I am trying very hard to have JOY in my life everyday; and to not allow the negative to seep in. I am choosing to only work on those projects that give me personal joy; or projects that will be bringing joy to someone else. 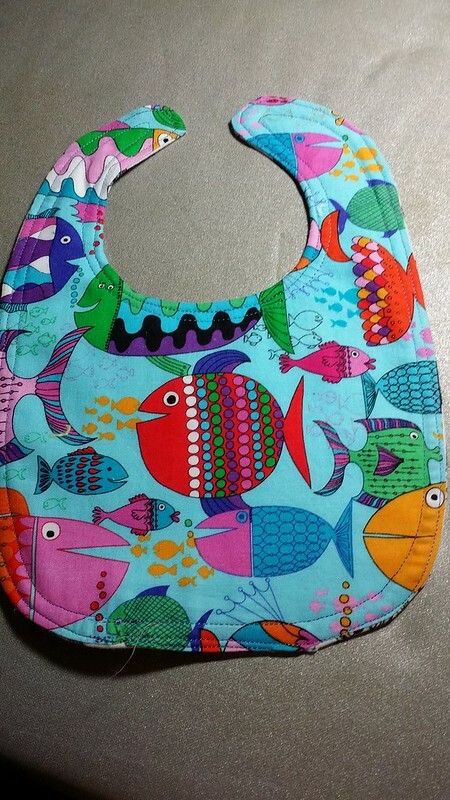 I do look forward to sewing today, finishing up a few baby bibs, and then working on a pillowcase for one of Ocean Waves Quilt Guild community service project, and a tote bag – big enough to carry a turkey, for Helping Hands Quilt Guild. The pillowcases go to patients at local hospitals who getting chemo or are in patient and need cheering up. 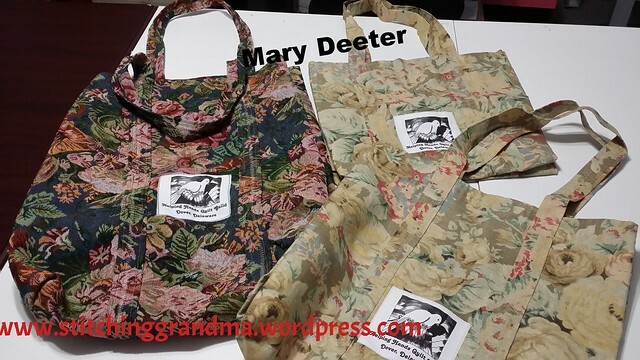 The tote bag will go to the food pantry that is held in the same church as Helping Hands Quilt Guild meets. I try to do my “best work” and pray that those who get these items feel a little joy during a difficult time in their life. As I opened up my emails/blogs/Facebook etc., before coffee this morning, I saw another of Bonnie Hunter’s posts with photo’s of her trip to Dover DE. Bonnie’s Show & Share in Dover DE on her blog post. Quick, open it in another page then come back. Are you back? Good, didn’t want you to miss the rest of my post. Flip back and forth or split your screen! Or, read this whole post and go visit Bonnie and then come back! The second thing I saw on the post, was a picture of me helping Edna hold her Allietare quilt. (Edna and I were room-mates for our little get-away.) Notice the lovely scalloped borders on hers! That means it is quilted, and bound. The 3rd photo is me (in green) holding MY Allietare quilt. I changed up the colors; and mine is still a work in progress. (I went for greens and browns instead of the greys and blacks the pattern called for.) I want a final border so it fits my king size bed. I showed the inspiration fabric with the quilt, but it doesn’t show in any of the photos. I plan to use it somewhere on the quilt, but I am still “not there”. Be sure to read the lovely embroidered label that Edna has on her quilt! Go one, go check out all the photo’s on Bonnies blog, run the slide show. Turn your speakers down a notch or two. Don’t forget to come back! On other matters – I run the “Second Time Around” table at Ocean Waves Quilt Guild. We get lots of donated items from members, and from people who find the guild through other means and have items to donate. 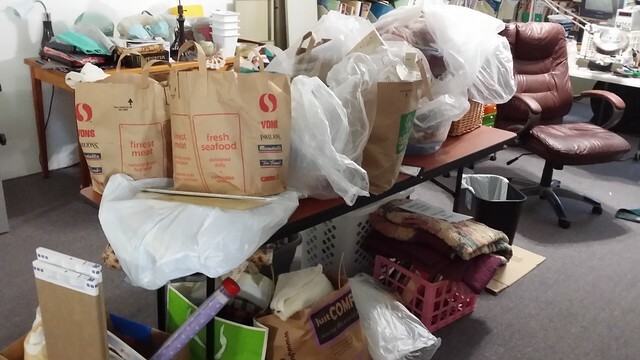 Last Friday I went to pick up an entire “sewing room” of donations. I filled my trunk, back seat and front seat with those donations. On Wednesday and Thursday this week, different guild members came over to help me sort, iron, measure, and price fabrics. We support our Community Service projects with this donated fabrics. My helpers were looking for things that would make great baby quilts and pillowcase; and while they were sorting they really helped me get through a few of these bags. I have many more days of sorting and folding and pricing to do before I get this pile into nice neat little stacks of fabrics. I am setting some items aside for the quilt show next summer, but also boxing up items to sell at the guild meeting in November and during the coming year. Yes, everything on and under that brown table was donated! And boy there were some treasures! More fun/joy – My newest grandchild, Addison, stopped by yesterday with her mommy. She got to visit with 2 of my quilting friends, Nancy and De, and arrived at JUST the right time. We had been sorting and folding and ironing and pricing donated fabric for about 3 1/2 hours when she got here. We were working on this big pile of donations! (This was day 2 for me of the sorting and folding and ironing, so I was happy to be distracted). It was a great stopping point and so much fun to sit and look at a sweet baby while her mommy went through my fat quarter baskets in search of fabric for “more bibs”. Addison is 6 months old, and has 2 bottom teeth that just broke through. She is drooling like a wet Rottweiler! 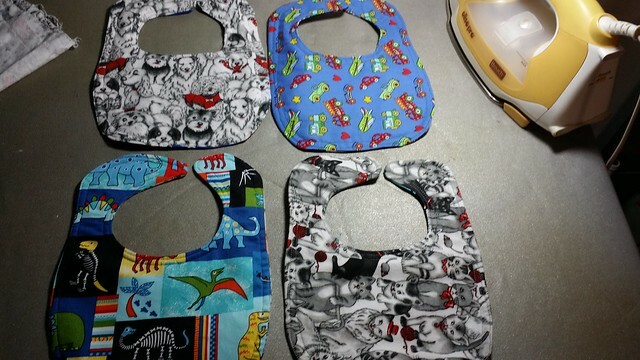 My friend Nancy, has been an expert “bib” maker, having a grandson who needed LOTS of bibs. She gifted me her patterns and left over PUL** fabric, and 4 bibs already cut out. I had dug in my bins for flannel and for some other fabrics; ordered a snap-tool and set of snaps and got busy last week. I picked up the snap tool on Wednesday. (Did you know you can order just about anything at Walmart.com and get free shipping for pick up at the store?) The snap-tool I got was the Babyville brand, and I ordered a package of snaps. It works very easily. Grandpa did the first batch of snaps, and I did the second batch. They were ready to hand off to Addison when she came to visit. I wish I had “snapped” a photo of her sitting on a quilt in my sewing room, playing with the stack of bibs! I sent her home with 9, and have started another 3. I just ordered another yard of PUL fabric from JoAnn Fabrics. It was on sale, and I got another 25% off, so I don’t mind paying their high shipping. 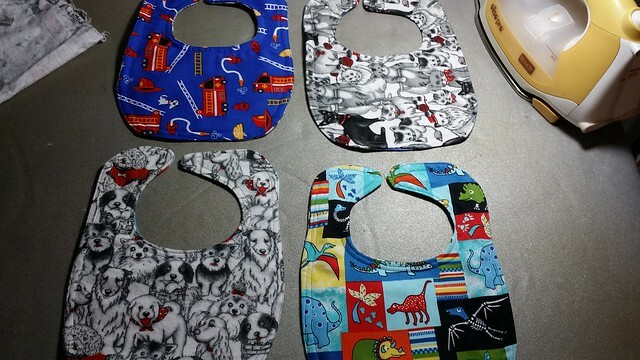 I am putting the bibs together with a layer of quilters cotton, a layer of PUL fabric in the middle, and a layer of nice flannel on the back. 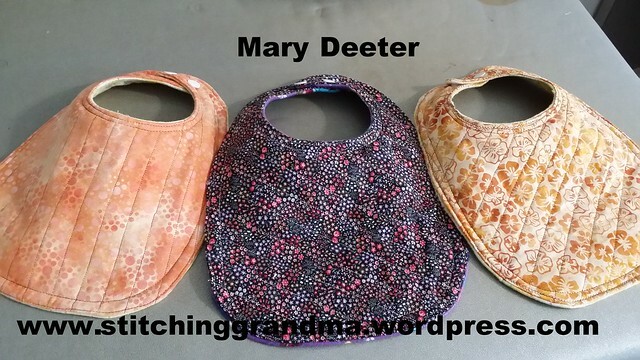 These are quick and easy to sew. My daughter pulled out some interesting fabrics for the next batch, and I have it all pre-washed and ready to cut. Addison will be a fashionista in her batiks and small print florals! 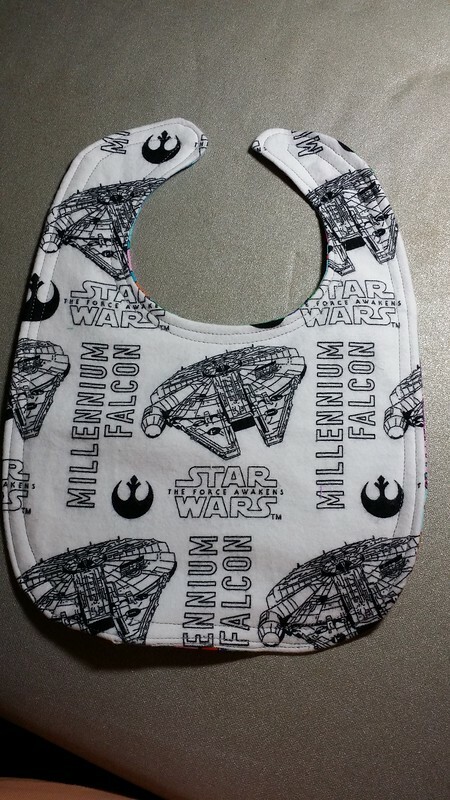 These bibs are really fat quarter friendly. I think I may modify the next pattern slightly so that the pattern can be cut on the fold, and I won’t have to worry about “right sides” when I cut the PUL fabric. I also am waiting on a “review” of the bib to see how absorbent it is. I might put a layer of quilters cotton batting in there to “soak up”. The PUL does help keep the “soaking thru”, but I am guessing a little extra thickness might be good. I could practice a little free motion quilting on the bib before I finish the assembly. Stitching through the PUL fabric defeats the purpose, but I could layer the quilters cotton and the batting; quilt it a bit to reduce the bulk with a tear away stabilizer behind it, then layer it with the PUL and the flannel. Open to other ideas if you have one! I hope what ever you are doing today brings joy to you and those around you.